You are here: Home / Blog / I promised the pictures of the dogs! the stone ones! Here they are!! I promised the pictures of the dogs! the stone ones! Here they are!! “Dog Scratching” on the left, ”Dog Barking” on the right! They have weathered to a lovely patina. From this magnificent wall of seventeenth century dogs and a stag came the original statues! Casts were made; and reproductions are now made of cast limestone. Now they are available! I love them! They are more interesting to me than a matching pair! Previous Post: « Thank you Tara Dillard, Velvet and Linen and Callie Grayson! Oh! I love these! completely love them! They remind me of my pup!! I think they’re divine! They really come to life in the garden and remain alive for a long time. Interesting history. what a wonderful thought! It is a way to keep a dog alive in your world…….a statue of that dog! 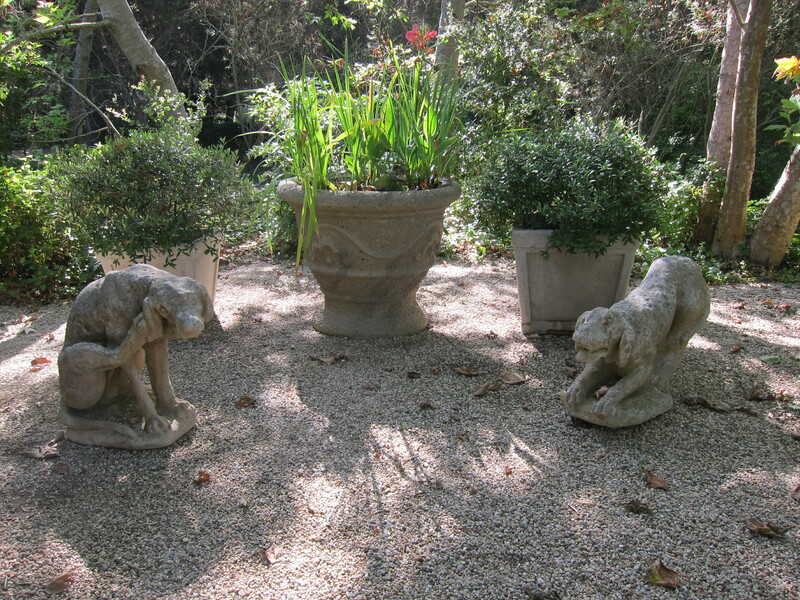 I do adore these dogs…….and I adore that these dogs were immortalized in the 17th(?) century! and I have them at my house! I really do love that! I will help you carry them!!! The wall with the dogs and stag are spectacular. As a dog person I would love the scratching dog, so cute. Love learning through YOU & yours! Hello Penelope and thank you, as always, for an inspiring post! Senlis is such an incredibly beautiful town with its beautiful chateaus and medieval architecture still intact. I love that these bad boys came from there and that they are so appreciated chez vous. the blog is perfect – a total reflection of you which should be the goal of a blog! And did you know that the Raray dogs are featured in the 1940s Jean Cocteau film “Beauty and the Beast” (“La Belle et la Bete” that inspired the Disney version but without the dogs)? There is a house high up on a side street in LA’s Laurel Canyon that has duplicated the wall but I can’t remember if the stags are included. The dogs are there though. Again, the bolg is perfect. These dogs (and stags) are so magnificent and whimsical at the same time! I love them! Perfectly French….. just lovely! Hello There. I found your blog using msn. This is a really well written article. I’ll make sure to bookmark it and return to read more of Penelope Bianchi of McCormick Interiors » I promised the pictures of the dogs! the stone ones! Here they are!! . Thanks for the post. I will certainly return. Hi Penelope: The wall of the hunt is truly magnificent. I have never seen an image of it, so I greatly enjoyed learning of it this cold evening in N.C.